Russian border patrol ships attacked and seized three Ukrainian vessels on Sunday near the Kerch Strait, off the coast of Kremlin-annexed Crimea. 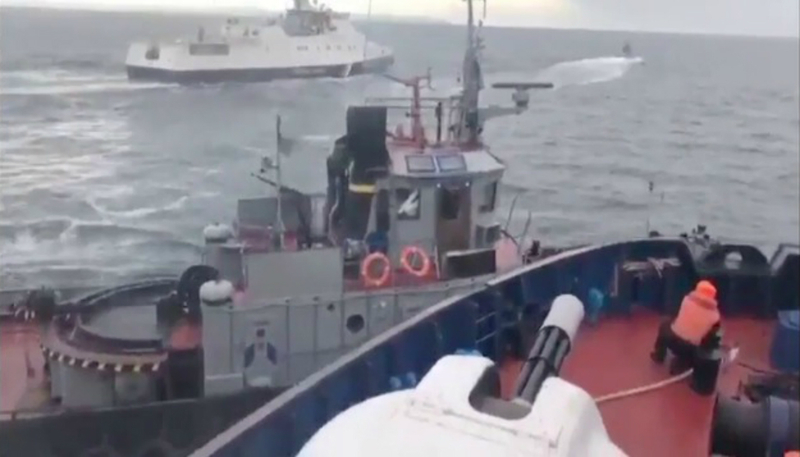 While Russia described the attack as a legitimate reaction to Ukrainian vessels violating its territorial waters, Kiev called it an unprovoked act of Russian aggression. In the aftermath of the incident, the first open clash between Ukrainian and Russian forces, lawmakers in Kiev voted for martial law to be imposed in regions bordering with Russia. On Sunday morning, two Ukrainian gunboats and a tugboat were intercepted on their way to the port city of Mariupol by Russian patrol boats. As the flotilla was approaching the Kerch Strait, a Russian coast guard ship rammed the Ukrainian tug. Russian fighter jets and helicopters were also deployed in the area, while bulk freighters blocked access to the Kerch Strait. Later that day, Russian ships opened fire on the Ukrainians and stormed the vessels. As a result of the attack, over 20 Ukrainian sailors were captured and between three and six were injured.